Get ready for another wave of massive health care deals -- and maybe this time the government will approve them. Health insurer giant Cigna's proposed purchase of pharmacy benefits manager Express Scripts for $67 billion comes just three months after Cigna rival Aetna agreed to be bought by drugstore chain CVS (CVS) for $69 billion. The insurance companies have been forced to find alternative ways to adapt and grow in a rapidly changing health care industry after the Justice Department blocked two massive deals involving four of the five biggest health insurers on antitrust grounds a year ago. Cigna (CI) and Anthem (ANTM) called off their proposed combination in February 2017 -- and rivals Aetna (AET) and Humana (HUM) announced they were ending plans to merge on the same day. UnitedHealth (UNH) is the other major health care insurer. But the Cigna-Express Scripts and CVS-Aetna deals, in theory, have a better chance of getting approved by regulators since they are so-called vertical, as opposed to horizontal, mergers. In plain English, that means the mergers aren't ones where two similar companies are looking to combine and take a competitor out of the market. Instead, they're trying to add a new line of business. Still, the deal between Cigna and Express Scripts (ESRX) is yet another clear sign that the health care industry in America could soon be dominated by just a small handful of giant conglomerates. For example, the pharmacy benefits management industry, which negotiates with the big drug makers to try and get better prices on prescription medications for consumers, is already dominated by Express Scripts, CVS and UnitedHealth. If CVS gets approval to buy Aetna, that means it will own a giant pharmacy chain, an insurer and a company that helps set the prices of the drugs that will be sold in CVS stores -- that many customers will use Aetna insurance to pay for. Whew. So it's unclear if antitrust regulators will greenlight this deal -- or the Cigna-Express Scripts combination. But don't be surprised if more health care companies succumb to the urge to merge as well, even as they wait for signs from Washington. Walgreens (WBA), which recently agreed to buy a big chunk of stores from rival Rite Aid (RAD), could potentially counter the CVS-Aertna deal with an acquisition of its own. That may put Humana and Anthem in play. Walmart (WMT) also operates a giant pharmacy business of its own and may feel the need to bulk up in the health care business. A lot has changed in the health care world in the three months since CVS announced the Aetna purchase. President Trump and Republicans in Congress have taken several steps to neuter much of the Affordable Care Act legislation that was a hallmark of the Obama administration. That has many people worried about rising health care costs once again. There is also now looming competition in the insurance business from three American corporate titans -- Amazon (AMZN), Berkshire Hathaway (BRKA) and JPMorgan Chase (JPM). 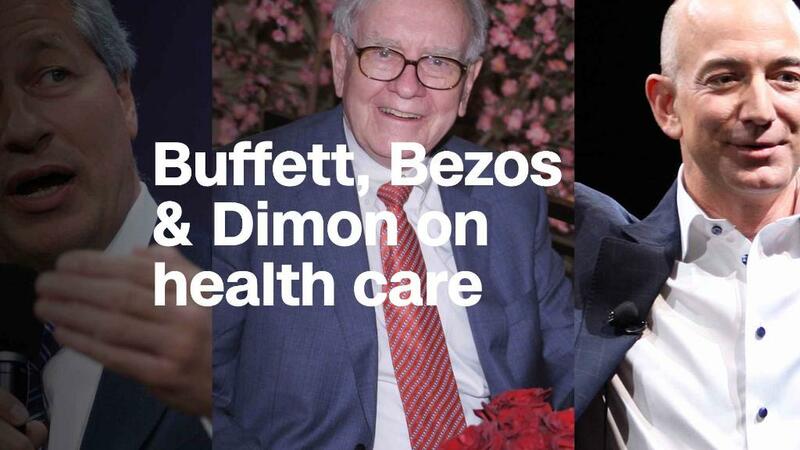 The CEOs of the three giants -- Jeff Bezos, Warren Buffett and Jamie Dimon -- announced in late January that they planned to start a yet-to-be-named insurance company for their employees that would be "free from profit-making incentives and constraints." The companies didn't provide many details about how the insurer would differ from other health care insurers. But the line about "being free from profit-making incentives" sounds like these companies want to do their best to keep prices low for their workers. Investors seem to be betting that all of this competition will lead to more consolidation throughout the health care food chain as well. Shares of drug distributors McKesson (MCK), AmerisourceBergen (ABC) and Cardinal Health (CAH) all rose modestly Thursday. But Humana and Anthem were slightly lower. Wall Street may be viewing them as the odd men out unless they soon decide to make a move that counters the ones made by their top rivals.